The Bailly Homestead, a National Historic Landmark, was the home of Honore Gratien Joseph Bailly de Messein (1774 – 1835). Bailly played a role in the development of the Calumet Region of northern Indiana. He was an independent trader in the extensive fur-trading network that spread from Montreal to Louisiana, and ultimately to Europe. Joseph Bailly was one of the earliest settlers in northern Indiana. In 1822 Bailly set up his fur trading post at the crossroads of several important trails, including the Tolleston Beach and northern branch of the Sauk Trail. He provided a meeting place for Native Americans and Euro-Americans. Except for White Pigeon, Michigan, Bailly’s trading post was the only stopping place for travelers and missionaries between Chicago and Detroit. The Bailly Homestead complex is the last remaining site of its nature in the Calumet Region, both in its capacity as a fur trading post and in its vernacular architectural features and construction types. 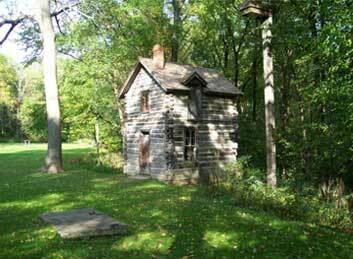 The Bailly Homestead was authorized as a National Historic Landmark in 1962.Bailly acquired formal title to the Homestead and the surrounding tracts of land, totaling over 2,000 acres, in the 1830’s when the Calumet Region was officially opened to Euro-American settlement. At his death title passed to his family. The Homestead proper was left to his wife and segments of the acreage to each of his children. In 1843, after the death of Bailly’s daughter Esther, management of the Homestead was assumed by Francis Howe, the husband of daughter Rose Bailly. Under Howe’s management the Homestead was again influential in the development of the area, as Howe sold timber from the land to be used in the construction of the nearby railroad. Upon Howe’s death in 1850 Joel Wicker, husband to another Bailly daughter, Hortense, assumed management of the Homestead. It was under Wicker’s management that the area surrounding the Homestead was settled. In an effort to continue providing timber to the expanding railroad Wicker recruited Swedish immigrants, then living in Chicago, to move to the area and operate the sawmill. Not only did the Swedes cut timber and operate the sawmill, they purchased land from the Bailly-Howe family and settled farms, bringing Swedish culture to northwest Indiana. Several log cabins, possibly dating to the 1860’s and probably of Swedish origin, are located on nearby farms that were once part of the Bailly Homestead.